All transactions are safe and secure with a reliable history in online purchasing behind each of our associates. 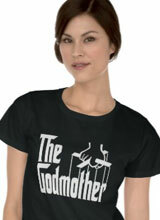 Buy The Godmother t-shirts to own Godfather clothing and merchandise. These bestselling women's The Godmother t-shirts are a fun way to show that Godmothers are just as cool as Vito and Michael Corleone. These black or white shirts read "the godmother" across the chest, with the classic Godfather hand and marionette strings below. Your godchildren will always feel taken care of after seeing you in this tee. This design is also available on tank tops, long sleeve Ts, hats, sweatshirts, and other clothing items. In addition to The Godmother tees above, browse the Godfather Clothing Gallery for more apparel like men's and women's clothes, kids shirts or hoodies.